DAYTONA BEACH, Fla. (AP) Roger Penske has a car capable of winning the Daytona 500. Maybe even three of them. Penske again went 1-2 at Daytona International Speedway for its second sweep of Speedweeks. This time, Ryan Blaney went to victory lane after winning the first of two Thursday night qualifying races that are used to set the Daytona 500 field. Chase Elliott won the second race in a Hendrick Motorsports Chevrolet to put a temporary halt on the Team Penske dominance. Joey Logano finished second to Penske teammate Blaney for the Ford sweep in the first race. Kevin Harvick was second to Elliott in the second race and Harvick was also in a Ford – proving the automaker has the same speed it did a year ago when it swept all four restrictor-plate races. Logano has finished second now twice in Speedweeks. He was beaten last week by teammate Brad Keselowski in an all-star race that opened activity at Daytona International Speedway. Keselowski is the Las Vegas favorite to win Sunday’s season-opening Daytona 500, but he wrecked with two laps remaining in the qualifier and he’ll need a backup for the main event. No matter, it seemed, because the Penske cars so far have the Daytona field covered. ”We’re going to make it happen,” Logano said about the Penske effort Sunday. The three Penske drivers dominated the all-star race and were at the front of the field for the entire Thursday night race. Blaney won it in overtime after Keselowski’s accident brought out the caution. Blaney did it with a pass that didn’t work last week. When he tried to pass Keselowski in the all-star race, he pulled out of traffic and didn’t get the help he needed to complete the move. This time he was able to get past leader Logano, then the Keselowski accident brought out the caution. On the restart in overtime, Blaney got a huge push from best friend Darrell ”Bubba” Wallace Jr. and pulled away for the win. ”I saw (he) was third and I’d figure he’d give me a good push,” Blaney said about Wallace. Wallace finished third and was congratulated with a huge hug from team owner Richard Petty, the seven-time NASCAR champion. ”That is probably the highlight of the night, better than finishing third, just seeing how pumped he was,” Wallace said. Jimmie Johnson was in his second accident of Speedweeks. The seven-time NASCAR champion dropped out of line just minutes after his race began with an apparent tire problem, and his car took an unexpected hard right into traffic. The contact wrecked Johnson, Daniel Suarez and Aric Almirola, and sent Johnson and Almirola to backup cars. He also wrecked on Sunday in the all-star exhibition race. 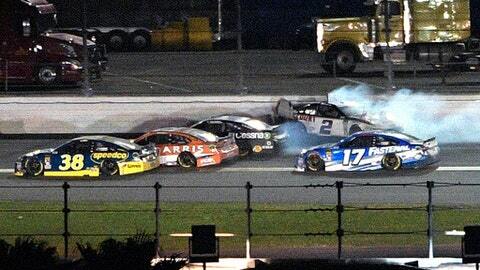 ”Tough way to start Speedweeks,” Johnson said. It wasn’t all bad for Hendrick Motorsports, though, as Elliott won his qualifying race for the second consecutive year. He might have won the Daytona 500, too, had he not run out of gas last year. ”We have the big one on Sunday – that is the main thing,” Elliott said. Hendrick has one victory at Speedweeks and the pole for the Daytona 500. Both are firsts for Chevrolet’s new Cup effort, the Camaro. The second qualifying race began with Green Bay Packers quarterback Aaron Rodgers watching from the top of girlfriend Danica Patrick’s pit box. The Daytona 500 is her final NASCAR race and Rodgers arrived in Daytona on Wednesday, Valentine’s Day, to support her effort. He ignored questions from media as he climbed off the pit box following her 14th-place finish in her race. Patrick’s plan for the qualifier was simply to stay out of trouble and keep her Premium Motorsports entry clean for her final Daytona 500. ”I was just playing it safe,” she said. Alex Bowman has the pole for the Daytona 500 based on last weeks’ time trials, and much like Patrick, his goal was simply to make it through the qualifying race unscathed. So Bowman dropped to the back of the pack and just made laps, a move that was criticized by veteran Harvick, a series champion and former Daytona 500 winner. Bowman said it was obvious his Hendrick entry was set to contend for the pole and needs adjustments before it will be strong in race trim.